Be the first to share your favorite memory, photo or story of Randal "Randy". This memorial page is dedicated for family, friends and future generations to celebrate the life of their loved one. He was born August 15, 1955 to Robert and Jean Bradshaw and was the oldest of two children. 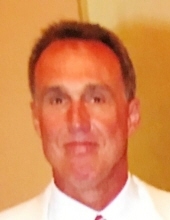 Randy was an active athlete and graduate of Saegertown High School. Upon graduation, he went on to study at Edinboro University where he was a member of the Fighting Scots football team. Randy worked for various businesses in the Great Lakes region, the longest of which was his employment at Salt Painting Inc. in Saegertown. In addition to working, some of Randy’s hobbies included deer hunting with his brother and nephew, playing in the Mount Hope, Riverside, and Venango Valley Golf Leagues, and walking his dog at the Woodcock Dam. Randy is survived by his wife, Marlene Jenkins, of thirty years, his daughter, Gabrielle Bradshaw, his brother, Jeff Bradshaw (Annette), his niece, Katie Bradshaw Roberts (Dave), his nephew, Patrick Bradshaw (Amber), and two great nephews, Connor and Cole Bradshaw. Randy will be remembered as a nonjudgmental, loving, gentle-giant. A Celebration of Life Service will be held on Sunday, February 10 at 3 pm at Sprague Farm & Brew Works (22043 US-6, Venango, PA 16440). In lieu of flowers, please donate to Hospice of Crawford County, Inc (776 Liberty St. Meadville, PA 16335), or the ALS Association Western Pennsylvania Chapter at http://webwpawv.alsa.org. To send flowers or a remembrance gift to the family of Randal "Randy" Aaron Bradshaw, please visit our Tribute Store. "Email Address" would like to share the life celebration of Randal "Randy" Aaron Bradshaw. Click on the "link" to go to share a favorite memory or leave a condolence message for the family.